Only 45% of employees are satisfied with their careers. This might be you, or it might be the people who work for you. Regardless, it’s a shocking statistic that highlights just how few people LOVE their work. So who are 55% who are satisfied, and who are the smaller fraction of people that LOVE what they do? 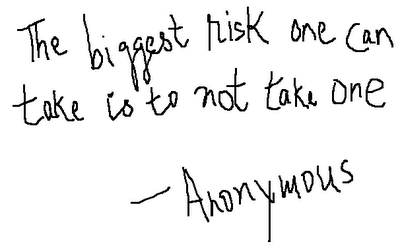 They are risk takers that have passion, purpose, and autonomy. They took risks, and worked tirelessly to create their own trajectories. Now is your chance to do the same. Stop by the 4 Hour Work Week Blog for a guest post by Reid Hoffman and Ben Casnocha: How to Take Intelligent Career Risk. And if you take the time to comment on the blog, they’re awarding the best comment with free mentoring from Reid Hoffman and Ben Casnocha. In addition to leaving at comment on Ben and Reid’s post for the chance to win free mentorship, learn how Experteering can connect you to “riskier” opportunities to give you a life-changing experience and an opportunity to develop new skills while building a better world.